Retailers masquerading as end-consumers in their purchases from wholesalers and lakhs of registrants not filing returns despite having made purchases — amid dwindling compliance rates and lower than expected revenues, tax authorities are grappling with such instances of evasion across the country under the goods and services tax regime. A similar trend of evasion has also been seen in the electronic-way (e-way) bill system, wherein higher frequency of short-distance trips for transportation of goods has been noticed as against the long-distance trips. 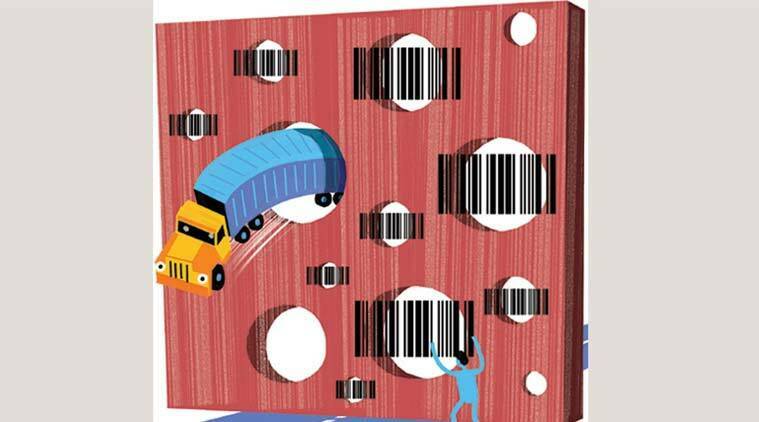 With the sliding compliance rates becoming a concern under GST, the taxmen are now looking at the scope of monitoring radio frequency identification device (RFID) tags nationwide along with the existing e-way bill system, three senior government officials said. States such as Uttar Pradesh have already mandated use of RFID tags for goods carriers and is scanning their movement at 41 locations through RFID card readers, a move which has helped the state to improve its revenue collections significantly, one of the officials said. A similar pilot project has also been executed by Maharashtra. “Evasion is quite rampant, especially at the middle level businesses in GST. Some cases have been detected in various cities where retailers are buying as consumers and not as businesses from wholesalers to save on tax on the retail margin,” one of the officials said. Tax authorities after conducting an analysis of GST returns have learned of about 2 lakh registrants who have skipped filing returns despite having made purchases. “An analysis of the system-generated GSTR-2A showed that about 2 lakh filers purchased goods, then sold in cash and have not filed returns. This was found after running a system query to know if anyone had sold their goods to them and that showed these filers not filing the returns to disclose the purchases. The information has been shared with states to act upon the evaders,” another official said. The other big instance of GST evasion is also being seen in the availment of input tax credit (ITC) where many bogus firms have sprung up only for the purpose of issuing fake invoices and claiming ITC. In the agenda for GST council meeting in August, the minutes noted that Union Finance Minister, who is chairperson of the GST Council, made a reference to ‘briefcase companies’ who sell goods enabling the recipient to take ITC and vanish after 2-3 months. As per the agenda record, the minister also said that if such firms were not traceable, then the recipient who had used ITC would be liable to pay tax even though he might have paid the tax to the seller. It has been suggested that to address this problem, one option could be that when a buyer was purchasing goods from an unknown seller or a new seller, he should obtain his GSTIN and make payment of tax to the government and pay rest of the amount to the seller. The compliance rate has been steadily declining under GST, with percentage of taxpayers who have not filed returns rising to over 28 per cent in November 2018 as against 10.56 per cent in November 2017, data shared by Minister of State for Finance Shiv Pratap Shukla in Parliament on Friday showed. 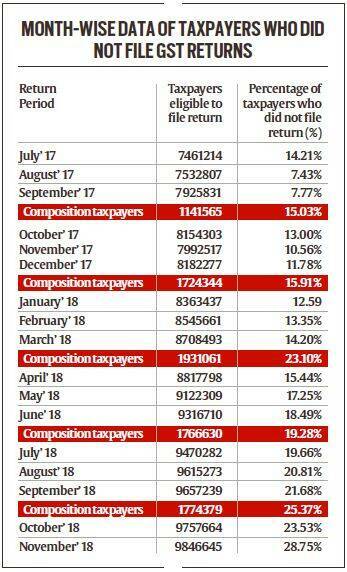 The composition scheme fares along similar lines, with the percentage of filers who have not filed returns rising to 25.37 per cent in July-September 2018 as against 15.03 per cent in July-September 2017, it showed. Also, as per official data, about 52 per cent of the total registrants under GST are showing a turnover of Rs 20 lakh, which is being seen as a big anomaly by authorities. One of the officials said that this reflects evasion as assuming even 20 per cent profitability will imply a Rs 4 lakh profit and since GST is mainly being paid in big cities, it’s “very difficult to assume that businesses are notaking this level of profit.” “The registrants are showing minimum level of turnover under GST and consequently also disclosing minimum level of income tax to evade compliance,” an official said.